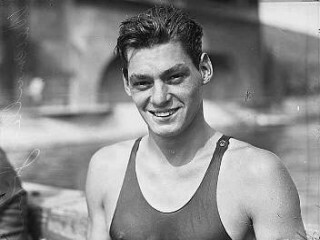 Johnny Weissmuller, who played the role of Tarzan in films made during the 1930s, was one of the best swimmers of the twentieth century. He won five Olympic gold medals, set 24 world records, and won 51 AAU titles. In 1925, 1926, and 1927, he won 15 more national titles. He held the record for the 100-yard freestyle, with a time of 51.0 seconds, for the next 17 years, and his record for the 200-meter freestyle stood for seven years. At the 1928 Olympics in Amsterdam, he won more gold medals in the 400-meter freestyle and as a member of the 4 Ã 200-meter relay team.